A steampunk first for me. I have to admit I probably would not have read this for awhile - if at all - if my friend Jean in Colorado hadn't sent me a copy. She's a school librarian and if anyone knows a good book when she reads one, it's Jean. All I can say is she was right on the money when she picked LEVIATHAN by Scott Westerfeld as something I would like. 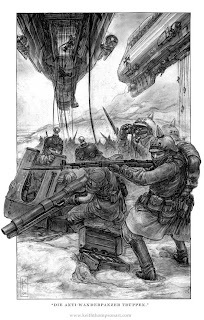 Even though I am not into the whole steampunk craze - don't know that much about it to begin with, though I think I kind of get the idea - I'm always curious about alternate history if handled in just the right way. (Hey, if ANYTHING can get kids interested in history - alternate or otherwise - I'm all for it.) I'm also not into YA books unless they are truly exceptional. - teen angst is not my thing at this stage in my life. I admit it.But I do recognize that there are many YA books that are well worth the reading. 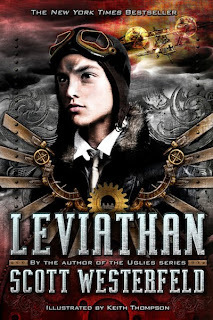 LEVIATHAN is a remarkably engaging adventure filled with wonderful, convincing characterizations, lightning fast action and fantastic apparitions from the incredible mind of author Scott Westerfeld. The story is set early in an alternate 20th century on the eve of WWI. A war brought about this time not by the assassination of Archduke Ferdinand and his wife, but of another Duke and Duchess, the parents of young Prince Aleksander who is then spirited away in the night just ahead of his enemies, by a small band of loyalists. The murders are being used (as Ferdinand's death was in reality) as an excuse to declare war. Thus begins the gripping story of nations at each other's throats in an Europe that is at the same time both recognizable and not. Alek's family has ruled Austria-Hungary for over 500 years, they and their allies are adherents and proponents of vast, steam-powered war machinery - Clanker technology - which is being used by enemies of the Prince and his cohorts allied with Germany. On the run with the help of their own metallic monster of a machine, a Stormwalker, a creature that operates on huge metallic 'legs' rather than wheels, they force their clumsy way through the night forest, just ahead of government troops in larger and fiercer machinery. This is a festering Europe of opposing forces, each side heralding their own brand of technology which in the coming war will clash head to head. The British forces are Darwinists, proponents of animal based warfare machinery: The science of DNA manipulation used by Darwin (whose granddaughter plays part in the storyline) and his descendants to create animal/machinery combos used for specific applications. i.e. 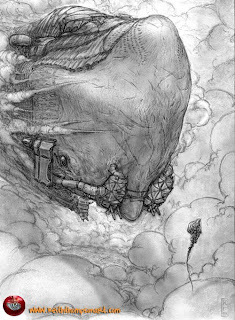 the huge Leviathan of the title, a whale airship that flies through the clouds with men and machinery: a 'live' creature whose one specific job is to fly on the hydrogen it manufactures. A mammalian air balloon of sorts. A creature that is managed and manipulated by dozens of other small hybrid animals, birds, worms, bees, etc. each with a specific job to do. So this is not only a coming war of ideology and power grabbing but of opposing technologies as well: CLANKERS vs. DARWINISTS. 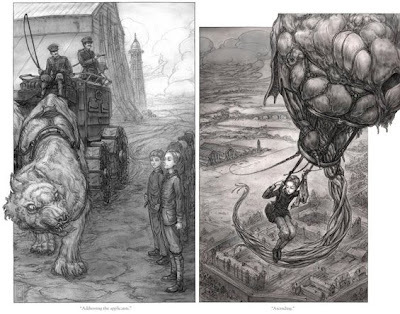 The energetic black and white illustrations of artist Keith Thompson, scattered throughout the book, are brilliant. They add another form of excitement to a story which is told at breakneck speed. Thompson's technique is perfect for this sort of book, the pictures work hand in hand with the written story, enhancing, as great illustration must, the writer's words. The story primarily belongs to two main characters: Alek, the young runaway Prince of the Hapsburg's (the ruling family which has turned against him because of his late mother's lowly birth), who, with his small band of loyalists must fight for his very survival in a world in which his high birth must be kept secret. And the British Air Service cadet, Dylan Sharp, a soldier who also has a secret of his own: she is Deryn, a fifteen year old girl masquerading as a boy in the elite forces. Only boys and men are allowed to serve in the armies of Great Britain, a profession which Deryn has aimed for since her late father taught her to fly. Alek and Deryn are thrown together by circumstance as the great Leviathan makes a forced landing on a glacier in the Swiss Alps. From that moment, their futures, are unknowingly entwined. But Alek must first get over his repulsion of the 'God-less' Darwinist creations and Deryn must overcome her contempt of Clanker technology dependent on machine parts and fossil fuel. The world is on the verge of a hideous war and friend and foe must somehow work together to deliver a secret parcel carried by the great Leviathan to the shores of the Ottoman Empire. This first book is part of a trilogy, the second book of which, BEHEMOTH is now available. I can't wait to read what happens next to Alek and Deryn and their world of Clanker and Darwinist technology. If someone hasn't bought this for the movies, I can't imagine what they're waiting for. Read more about the books and their author Scott Westerfeld at this link. You might like it. Take a chance. It was a lot of fun. I'm on a steampunk break right now, though I've heard really good things about this one. I'm just not sure I want to start a new series right now. Ryan: This is my first steampunk experience. Ha! I have to say, I loved it. I will definitely read the next and maybe I'll look around for some other steampunk story...Not for awhile though, I've got so much else to read. This series rocks! Kids fight over my copy of this and Behemoth... If you like Westerfeld, try the Uglies too. Other young adult series that rival "adult" lit: Chaos walking or the Hunger Games. I cannot keep either in my class library. I can understand why kids love LEVIATHAN. I love it and I'm not a kid. BEHEMOTH is on my shopping list for sure! The Leviathan is the best book you will ever read. The Behemouth is good but not as good. Scott Westerfeld is the best writer ever. I would rate the book 10/10 if I could.